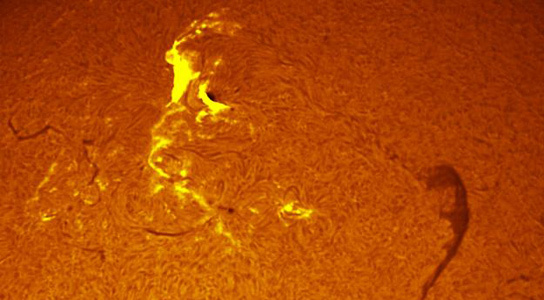 An active sunspot erupted on Sol on January 19th, at around 16:30 UT, which produced an M3-class solar flare as well as a full-halo coronal mass ejection that’s currently on its way almost directly to Earth. Analysts at the Goddard Space Weather Lab state that strong geomagnetic storms are a possibility as a result of active sunspot 1401. The impact should hit Earth this weekend, January 21st at 22:30 UT. Geomagnetic storms are a temporary disturbance in the Earth’s magnetosphere and are usually caused by solar wind or CMEs, which in turn will cause auroras visible in the northern and southern skies. The cloud is also on its way to Mars, and will hit the planet on January 24th. NASA’s Curiosity rover, which is currently en route to Mars, is equipped to study solar storms like this, and might be able to detect the particle energy as it passes by. The increase in solar activity will clean up satellite debris around Earth, which is good news for satellite operators. The Earth’s atmosphere has been puffed up in response to increasing UV radiation from sunspots. In turn, this will help clean up low-Earth orbit debris. The number of debris in Earth orbit has actually decreased in 2011. The debris should continue to decrease in 2012 and 2013. 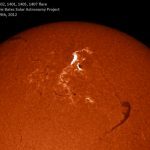 Be the first to comment on "Strong Geomagnetic Storms a Possibility After Active Sunspot 1401 Erupted"